Living alone for the first time ever. Finally being able to stay up as late as you want, studying — at least ostensibly — between bouts of laughter with newfound friends. These are just a few of a whole bevvy of firsts that come along with going away to college. We don’t have time to list them all here… and besides, there are a number that mom and dad would probably rather not think about. But there’s another, potentially-less-cheerful first facing most new college students. Spoiler alert: It’s money. College may well be the first time you’ll be expected to pay your own bills. And for many, this first foray into financial responsibility can be crippling. It’s certainly not breaking news that college is expensive. According to Student Loan Hero’s most recent numbers, the average student goes into more than $37,000 of debt trying to afford it. But there are other expenses you can totally avoid. But despite how it may seem, you don’t actually need to go on a giant shopping spree in order to ensure your success as a college student. … but only after we spent it. Want to save your cash — and your trunk space? 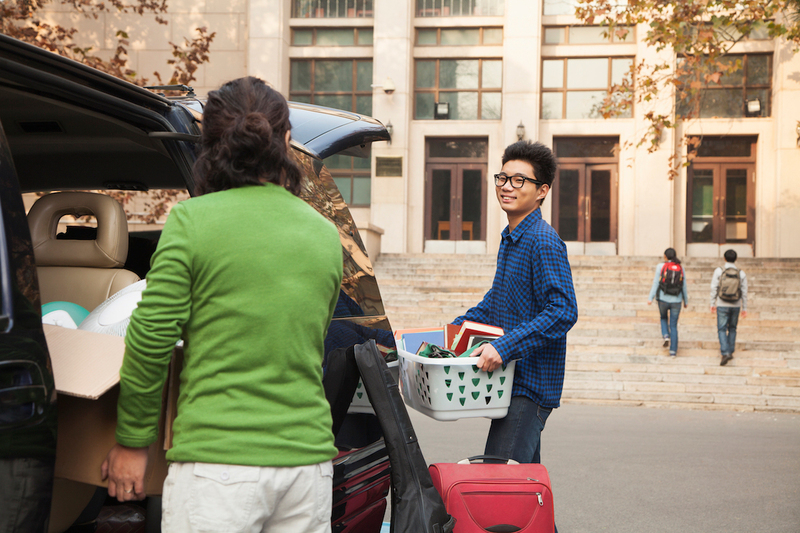 Strike these items off your college shopping list immediately. Listen, I’m not saying you’re not going to eat some serious noodles while you’re in college. It’s a stereotype for a reason. But if you want to avoid the freshman 15, you’ll need to ditch your Ramen-only diet plan. Fortunately, there are plenty of dorm-friendly meals you can make for less than $5 a serving, even if you have nothing but a microwave and a mini fridge at your disposal. Which leads us to our next list item. Want to avoid spending a hundred bucks or so on something you likely won’t ever have another use for? Then don’t buy — or rent — a mini fridge. At least not without checking out your dorm setup first. In many cases, you’ll have access to a full-sized kitchen — or at the very least a community fridge to service the floor. And if not? There are tons of healthy snack options that don’t require refrigeration, including protein bars to nuts to jerkey. And room-temperature water won’t kill you — promise! As anyone who’s ever meandered absently through Target in August knows that this one can be a real budget killer. But as tempting as that neon pink shag rug or cute succulent display might be, think twice before you indulge your nesting instinct. Carrie Nowlin, who graduated from Florida College, had a similar case of buyer’s remorse. First of all, you’re 18 years old. Your entire style is likely to change over the course of the next four years… or possibly even the next four months. Second of all, you’re kidding yourself if you think you’re not going to live in yoga pants or basketball shorts all year. No one gets dressed up for class after the first week. Listen, I was one of those crazy-nerdy kids for whom school supply shopping was Christmas-morning-level exciting. But are you really going to use all those fresh, crisp pages? Other ex-students admitted to purchasing a planner every semester… only to use it for a week, at best. Your professors might not like this one, but hear me out: there are plenty of ways to read all the assigned material without paying through the nose for brand-new — or even used — textbooks. If a book is assigned, it’s highly probable the campus library has a copy or six — not to mention the ones other students have purchased. Borrow a friend’s book and take ample notes, or head to the copier bay at the library. Although textbooks are copyrighted, it’s likely alright to make photocopies of small portions under fair use law. If you do purchase the book, avoid buying new by any means necessary. Here are ten more ways to save money on your college textbooks. Even if some of your professors still require printed copies (who are these people? ), it’s likely your school provides a certain number of printer credits per semester, allowing you to use the library machines for free. And even if you have to pay per page, trust me: five cents a page is way better than buying replacement toner. Not only will you have to pay for gas, insurance, registration and possibly an auto loan installment — you’ll also likely be on the hook for a parking space fee from the college. All those auto-related extras can add up quickly, and you’ll probably use your car less often than you imagine. Here’s some quick math that’s actually useful: Don’t spend $100 on something you’ll only use for one class. Share with your classmates or make friends with a chemist instead. Is this even a thing anymore? It’s definitely crucial to backup your information, but it’s a way better idea to do so on the cloud. Physical hard drives fail, and they’re still surprisingly expensive. Many schools even offer campus-wide subscriptions to services like Dropbox at a discount or even totally free of charge. It might be nice to have one backup set for laundry day… but it’s a college reality: You probably won’t change your sheets that often. That’s alright — for now. You’re only a fledgling adult, and regular bedding changes are a pretty pro adulting maneuver. Yes, you need a bath towel or two. But any more than that just eats up valuable storage space. If you do laundry once a week, you’ll get by just fine with only a couple. Don’t get me wrong: you should definitely clean your dorm room or suite. Frequently. With bleach-based products. But if you’re sharing the space, you can also share those cleaning supplies. More often than not, you’ll be eating at the dining hall — or, honestly, at the local Chipotle. And when you do eat at “home”? “I just used paper ones to avoid doing dishes,” wrote University of South Florida graduate Brandee Baker. Um, use Netflix on your computer? It’s 2017, people. Eating at least a few meals at your college cafeteria is all but unavoidable, but most students don’t live exclusively off dining hall food. It can get old pretty quickly. “When I went out for orientation, the food was great,” said Florida International University graduate Matthew Borghese. Lesson learned: Think carefully about your meal plan and whether or not you’ll regret buying the “deluxe” version. If you care about sports at all, you should definitely attend at least a few games. It’s a pretty iconic college experience. But don’t pay for a package of tickets ahead of time unless you’re absolutely certain you’ll follow through. Oh, well. College is supposed to be a learning experience, after all.